Hatred, Ridicule & Contempt is the first novel by David Cooper. As a solicitor, it is perhaps unsurprising that he has written a novel about the law, sticking to what he knows. 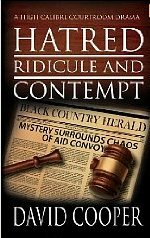 Hatred, Ridicule & Contempt follows Alex Harris, a solicitor who at the start of the novel is made a partner at his firm. Having been passed over the previous year, Harris is pleased to finally have his hard work recognized, yet as the novel goes on he learns more and more of the firm’s dark secrets and management style. The main story centres around Harris’s case defending a newspaper against libel accusations, which soon turns out to be connected to a much bigger picture. On beginning to read Hatred, Ridicule & Contempt, the first thing that struck me was the rather dry style of the narrative. I began to worry that I was faced with a first novel written in a self conscious fashion, the author trying too hard. The dialogue occasionally had a slightly stilted feel to it. Yet before too long, I found that I was becoming absorbed in the story. Hatred, Ridicule & Contempt is no British John Grisham, where characters are often running for their lives, but the legal wrangling and office politics created a very effective tension, which had me continuing to turn the pages to find out what happened next. It was a more subtle effect than the events you might find in the pages of a Grisham novel, such as running from the mob, but tense nonetheless. Once I was drawn into the story, the dry style was no longer an issue. In actual fact, it contributed to the atmosphere of Hatred, Ridicule & Contempt. The practise of the law in Britain is very different to the US, so Hatred, Ridicule & Contempt should not really be compared to John Grisham. Take the TV show Law & Order UK as a visual example: contrast the dignity and pomp of the UK courtroom to the outbursts and shouting seen in the original US version, and Cooper’s dry writing style makes perfect sense. As for the stilted dialogue, this was noticeable throughout – I often couldn’t imagine people speaking like the characters in the novel did. To be fair to Cooper though, I don’t know any solicitors – maybe this is how they speak. There is a lot of legal detail in Hatred, Ridicule & Contempt, and several lengthy passages, mainly from Harris, of legal arguments. These can be a little complex but the flow of the story is not impeded by these sections, and the novel does not become bogged down by heavy legal information. Hatred, Ridicule & Contempt is self-published by the author on Kindle, and at times this shows in the editing. There were few typos or grammatical errors, which are all too often present in self-published novels. There were a few sections where the use of italics seemed to run away with itself though – the author would use italics to represent a change of focus, such as to narrate Harris’s thoughts, but then the italics might carry on for a few paragraphs after that, for no apparent reason. This is hardly a big problem but one that could presumably be easily rectified. I found myself surprised by how much I enjoyed Hatred, Ridicule & Contempt, mainly due to my uncertainties over the dry style at the beginning. It is a novel which should have a wide appeal, particularly for those who enjoy legal thrillers and would like to try something different to the usual American fare. Many thanks to David Cooper for providing a review copy of Hatred, Ridicule & Contempt. No Comments on "Hatred, Ridicule & Contempt"